To beat the bar exam, students must focus on interactive study strategies. Too many students over-rely on watching lectures and filling in outlines. Your time is much better spent on testing yourself repeatedly, even if it seems that you keep getting the answer wrong. You need to use a system where you can see a question without being able to simultaneously see the answer, so that you force your brain to actively recall the answer. This is called active recall testing, and it has a significant body of academic research demonstrating its effectiveness. Flashcards are an excellent method of active recall testing. Below we’ll look at how to make and use flashcards to ensure your success on the exam. But first, let’s address one of the most common misconceptions about the essay exam. You will not pass the Virginia Essay Exam with that mindset. You will only get credit for legal rules that are close to being right, or exactly right. If your rule is just completely wrong, or you use the wrong rule for the question, you will not get credit for that rule on your essay answer. So the key to passing the essay exam is memorizing the Virginia black-letter law that is most likely to be tested. This is where many students fail–they spend too much time watching lectures and reading outlines and not enough time memorizing and practicing Virginia black-letter law. You cannot succeed on the Virginia essays unless you know Virginia legal rules. Flashcards are an excellent way to memorize the legal rules that you must know to pass the exam. Flashcards can be electronic using an app such as Anki or Quizlet. Some people prefer to use flashcards on paper index cards. Don’t get bothered by this decision–you can use whichever method you think is most effective for you. The electronic cards have some advantages in sorting and tracking your performance, but some people just learn better with tactile paper cards. Do whichever one makes you feel more engaged with the material. Creating your flashcards is an important part of your study process. You should devote an hour or two each day to creating flashcards for Virginia law. There are 2 sources of law you can use to create these. First, you can use your bar review program’s condensed outlines of Virginia law. Second, you can scan through your bar review program’s essay answers to locate relevant legal rules and create your cards. Most students have more success with the second of those two methods, but some students use some combination of both. Do not use the full outlines of Virginia Law; the bar review programs provide a ‘condensed’ or short version of those outlines. Use these shorter versions. The full outlines of Virginia law contain far more than will be tested on the exam. After you’ve decided on what your source material will be, you next must decide how to actually put that material into flashcard form. Each flashcard must contain only one simplified legal rule. Complex legal rules must be broken down into their individual parts and then put into a ‘testable’ format that you can put on two sides of a card. For as many cards as possible, you want the card to be reversible. This means that you should be able to look at either side of a card, and recall what is written on the reverse side of that card. Side 1: If a testator has a will that contradicts a previous written contract, which one prevails? Side 2: The will prevails. However, when a specific disposition of an asset contradicts to that of the contract, the beneficiary of the will/asset will become a trustee of that asset and then specifically perform under the terms of the contract. The above-example is not a good flashcard. It attempts to cover too many legal concepts. Further, it is not reversible. If you look at “Side 2” first, the card makes no sense. Let’s see how we could improve this, and still test the same legal concepts. Given the card above, I would actually advise creating 3 separate flashcards for that legal concept. See the example below. Side 2: This type of contract must meet all the standards of any contract, even though the contract might be mistaken for a will. Side 1: Contracts to dispose of real property are generally enforced through the remedy of ____. Side 2: Specific performance is the default remedy for enforcement of these situations. When you compare these, you should notice how I’ve converted one complex flashcard into three different flashcards. Also, in at least two of the three new cards, notice that they are reversible. No matter which side you saw first, it should prompt your memory of what is on the reverse side. The first and third card are the best examples of this. When you’re deciding what rules to memorize, you need to step back and look at the big picture. What legal rules will be necessary to answer the question? Break it down. If you are creating cards by scanning through practice essay answers, and you are making a card for every legal rule & sub-rule you encounter, you should be able to create 5 to 10 cards per practice essay. You should study your cards in topics and in small groups. Don’t mix them all together. Your brain needs to make connections between the cards within each subject area. 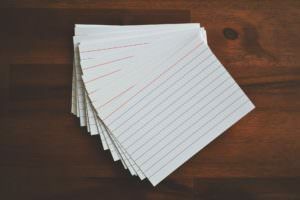 Assuming you’re using paper flashcards, when you start a study session just take out about 20 cards (at most) from one subject area. We’re going to call these 20 cards your “active deck”. Start by reading all the cards in your active deck. Then go through them again, this time trying to remember what is on the reverse side of the card without looking. When you remember one perfectly, set it aside from the others and keep going with the remaining cards in your active deck. After a few minutes of this, there should be no cards left in your active deck. Now, grab another 20 cards and start the process again with your new active deck. If you’re using electronic flashcards, your program should have settings that will allow you to automate the above strategy. Don’t use an app or program that forces you study from your whole deck every time. It is critical that you only study a handful of cards at a time. It doesn’t work to try to study 100 cards at once. The repetition of any individual card will not be frequent enough to lock that card into your memory. The key to studying flashcards is to have very frequent repetition of a card until you know it well. Then, you still should occasionally encounter that card again, but not nearly as frequently. Again, what we’re doing here is a research-based method called “spaced repetition“. This type of studying can be automated, which is one of the advantages to using an app like Anki. It automates the selection of an ‘active deck’ and presents you with the right cards over the right interval for your own memorization. You can do it manually too, but you must discipline yourself not to try to tackle too many cards at once and to occasionally return back to cards you’ve learned to refresh your memory of them. 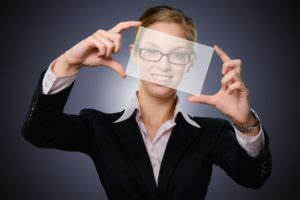 Every Virginia Bar Exam student knows that Wills, Virginia Procedure, and Federal Jurisdiction are tested much more frequently than Taxation and Suretyship. Use your bar review program’s subject frequency chart and spend your flashcard time (both creating and studying them) roughly in proportion to how often the subjects appear on the exam. If you focus on interactive memorization with spaced repetition, you can learn all the Virginia legal rules that you need to know for the exam. For more help on the Virginia Bar Exam, consider the LexBar online course for the Virginia Essays.